On a pleasantly warm September day the energetic Ulrike led us to her “Garden of Eden” in the middle of the botanical park where we could feel the vibration and buzz of the bees, and not just any ordinary bees, but those that are part of the #beesustain project. The pleasantly blue and orange beehives create a soothing, calm atmosphere and they fit perfectly into the environment of the park. The urban beekeepers, under the brand name of “Bybi”, produce everything from honey beer to fine honey sweets. Their partners are among others numerous eminent companies from meetings and other industries. In addition to Copenhagen’s Convention Bureau, their partner is also Bella Centre and the Danish Red Cross, who teach Syrian refugees the craft of beekeeping. I must admit that the honey is of an excellent standard and that my first insight into Bybi’s social entrepreneurship was my first contact with Denmark’s truly sincere story about sustainable congress tourism. When I later rode the famous cycling snake (Cykelslangen) for the second time it became clear to me that the Danish concept of Meetovation comes from a very harmonious and extremely coherent view of the world, which also answers why the Danes have been repeatedly declared as the happiest nation in the world. Furthermore, the city and the Danes are consistently responding to changes in the environment – if you want to seriously address the problem of ecology, for example, it is necessary to close the city centre for all traffic. So, in return the Danes offer excellent public transportation and incredibly well organised and well connected bicycle paths that are as wide as car lanes and are functional also in the winter, which I experienced first-hand. In Denmark it is therefore not unusual to make between a 10 to 15-km long bike ride. The story behind the idea of Meetovation became clear, crystal clear to me. I began to see it in a whole new light from the last time I participated at the extremely successful conference, the European Meeting & Events Conference (EMEC). 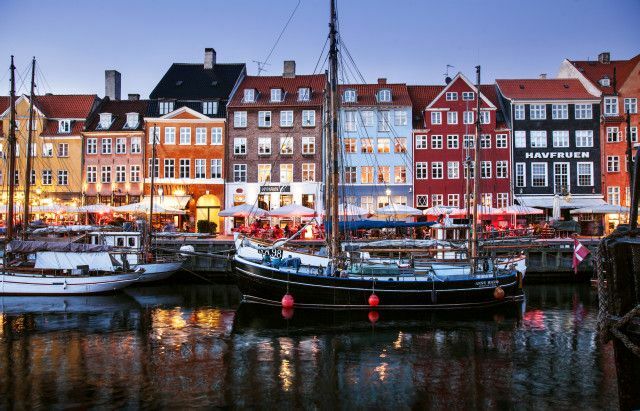 Copenhagen might not be the most beautiful city in the world, but the modest and yet confident Danes have proved themselves in providing exceptional event content that completely prevailed over the standard meeting format. Everything that we, as participants, expected from the conference, the organisers turned upside down. Through active participation of each conference participant, a nice conference story was created that was also written into our storybooks. The organisers created and shared stories with us and I believe that every participant found their favorite one that inspired him/her most. In my storybook I wrote about those who teach us to look at the meeting and convention industry from a different point of view. Danish meetovator Bo Kruger stakes his bets on the active involvement of every conference participant. And his moderation skills, once again, did not disappoint. I personally experienced his moderating approach at the autumn 2014 press trip and it worked just as great in a group of more than 400 participants of the EMEC conference. His flirting with the stand-up strategy is not just about his enthusiasm for stand-up techniques and methods, but more so reveals his sincere engagement in search of the best way to avoid the dull and boring concept of events’ programmes. The genius of the “Meeting Design Game” completely amazed this year’s EMEC participants, as it represents a true innovation in the field of meetings and conferences planning. Throughout the game (gamification) participants and event organisers were involved in different challenging tasks followed by rewarding feedback that gave an added value to the event. At the press conference it was announced that the Danes are preparing a new version of Meetovationa 3.0., which will include even more tools and techniques for enabling active participant cooperation the during the event. My interest in modern architecture is not the main reason for why I like to visit Scandinavia, but it means a lot to me and it inspires me greatly. From the outside Scandinavian architecture appears modest, simple and common, but on the inside it reveals a variety of different materials, colours and patterns that form a full and harmonious whole. The result of the Danish neo-classical architectural style was wonderful, organic-shaped furniture that is embodied in the products of the legendary Arne Jacobsen. The functionality of the congress facilities, the use of natural materials, simply shaped but functional congress furniture that can be easily combined…all of the these things turned the otherwise rather dull Radisson Scandinavia conference room into a pleasant living room. A typical Danish ‘hygge’ atmosphere was created – a casual atmosphere where all the participants can relax, socialise and feel very “hyggelig”. The moment you visit the fancy market Torvelhallerne you realise how seriously the Danes are when it comes to social responsibility. The market’s offer is predominated by organic, eco-produced food that is quite clearly also highly appreciated by its customers. The products are labeled with multiple product certifications and it appears that the food production is regularly monitored and strictly controlled. Smart exploitation of natural resources is the foundation of Danish life philosophy and therefore the many examples of sustainable entrepreneurship in Denmark, among which is the above mentioned Bybi beekeeping project, are no surprise. Denmark has not been listed at the top of the charts of the most sustainable countries in the world by chance. The Danes have been slowly modifying their legislation in favour of sustainable development since the nineties. What is even more inspiring is the level of knowledge and ability to innovate – another category where Danes are ranked at the world’s pinnacle and why Denmark is considered one of the most advanced states in the world. During our bicycle tour through Copenhagen we saw that Noma, the legendary restaurant, was closed. The famous chef René Redzepi announced that the last meal in the famous restaurant will be served in December 2016, or more precisely on New Year’s Eve. He is closing the old restaurant, only for it to be replaced by a new, even more crazy version of the previous one. The new restaurant – Noma 2.0 – will be situated in the industrial zone near Christiania. It will become an urban farm, despite the fact that the old restaurant was considered as one of the best in the world. Danes love to pave their own way and this is what brings them world fame. The transformation of one of the most famous restaurants into an urban farm with the philosophy “from stable to table” is a typical example of a strong desire to progress, and many other local stories from Copenhagen are driven by this very same desire. We all wish that the time and money invested in meetings were usefully and wisely spent. That is why in this matter measuring event effectiveness is crucial. We need to measure whether we have increased awareness of the product, created competitive advantage and ultimately created a profit. If I look at my last visit to Copenhagen and compare it to a theatre piece, for example, I can say it has fully satisfied my expectations. I believe that the conference organisers feel the same and will certainly know how to measure the conference’s ROI. And what of all of the above-mentioned can we, as event organisers, immediately use and transfer to our work and practice to create a true conference “hygge”? I have summarized a few of the ideas and pieces of advice into ten recommendations that you can use in organising your next congress or event. 1. Where there’s a will there’s a way: For every event, no matter whether it’s the first, tenth or hundredth time you’re organising it, it is necessary to organize it with the same care and precision as if it was your first. The most important step is to define your objectives and to determine to whom the event is intended. You should address your full attention to it and then subordinate everything else to the event’s participants. 2. The participants must be placed at the forefront: Careful planning means delivering your best – for place, time and circumstances of the event – all within available financial capacities. This also means adjusting the accompanying programme and not burdening participants with an overloaded agenda. Less is definitely more in this context. 3. Change congress halls into living rooms: classic congress halls can be the first obstacle in creating a pleasant congress atmosphere. If we come to terms with the average appearance of congress halls, we will hardly achieve the other phases of “meetovation”. The room where the congress is taking place must be inspiring from first glance and it often doesn’t take too much to transform a completely dull conference hall that resembles a tomb into a pleasant socializing area. 4. Special venues for special participants: If you look around yourself you will immediately be able to list at least a few really special venues located in your neighbourhood. Lifting the veil of mystery and exclusivity of certain places is generally rewarded with great participant enthusiasm. These places are usually more connected with the local community and create a better event dynamic. 5. Cultural heritage as an inspiration: The legacy of the past that influences our present lives is of great importance for congress participants. In emphasizing the importance of cultural heritage we must avoid everything that is not an integral part of common people’s lives. Authenticity is a basic rule in incorporating this element to the event’s programme. 6. Activate the participants: A variety of methods and techniques that were presented to us at EMEC in Copenhagen by Ann Hansen and Bo Kruger can be used straight away. For more information visit: http://www.visitdenmark.com/denmark/meetovation-meeting-designs. 7. From stable to table: Local self-sufficiency is growing in importance and whilst caterers will try to convince you that organising local food supply is difficult, it is in reality very simple and cost-effective. Insist on local supply – participants will know how to appreciate it. 8. The best food for the brain: The brain needs quality fuel! Healthy fats, antioxidants, the right dose of “healthy” carbohydrates. These are main ingredients you should demand from the dishes of your caterers, hotel or inn. 9. The pace of the event: Music is an important part of events, as it dictates rhythm and creates harmony. Music is a universal language to which we react spontaneously. Learn how to create your own specific groove and beat of an event. 10. We don’t create events, we create stories: Stories have always united and inspired people. Through stories we learn about life and values. Learn how to incorporate them into your events. We share our stories with our participants, telling them who we are and what inspires us in making each event a special one. The Vikings have made their own way and they have succeeded in creating an authentic, sincere and above all useful methodology: MEETOVATION. To top it all off, this innovative and original concept plays the leading role in the Meetings architecture strategy, where other generic models are hardly able to keep up. If you like to play games you will be most definitely be impressed by The Meeting Game Design, just as I was. I have actually become its biggest fan and user! Through this funny game you will learn different management skills in organising events and maybe even develop your own congress story. To conclude: the ability of good storytelling has always been a highly valued skill, so it’s time for you to start your own story.